The dash tag is currently a synonym for the unity-dash tag, so all questions that are tagged with dash are automatically retagged with the unity-dash tag instead. Ubuntu 17.10 and later also has an applications dashboard which is also called the Dash. Although the new Dash looks the same as the old Dash, there is a new tag for it called gnome-dash instead of one tag for both. This is not the expected behavior. It is awkward and cumbersome. A better way to do it would be to convert dash from a child synonym of unity-dash into its parent tag and make both unity-dash and gnome-dash synonyms of dash. In case anyone disagrees with the existing names for screen real estate objects in Ubuntu 18.04, this is not what this question is about. If you want to ask about changing the names for screen real estate objects in Ubuntu 18.04 feel free to do so, but please ask about it in another question. This question is only about how we should tag the Dash, not about possible new names for the applications dashboard in Ubuntu 18.04. If you don't like the name Dash it's OK to suggest a new one, but that's the name it has for now and this question is about how to tag it, not what would be the best name for it. I never heard anyone referring the "screen that appears when you click the "Show Applications" button" as "dash" in respect of GNOME. Only the side-bar thingy which appears in "Activities" overview (and "Show Applications" screen) that contains running and favourite app icons and the "Show Applications" button is called dash in GNOME lingo. Refer to the screenshot below (Note: it's an older version of GNOME shell, there are some minor changes in the recent ones). Go to the official GNOME shell extensions website and search with the keyword "dash". What would you find amongst the popular extensions? Now Ubuntu developers turned this "GNOME dash" into a fully fledged dock by having the gnome-shell-extension-ubuntu-dock package (which is in fact a fork of the "dash to dock" extension mentioned above) pre-installed and activated by default in the standard Ubuntu sessions (both Xorg and Wayland) on Ubuntu 17.10 and later, and we have a ubuntu-dock tag for it. install and use vanilla GNOME session on Ubuntu 17.10 and later. So I second @muru, "GNOME dash" is a pretty minor thing to have a tag of its own. you get to the "Show Applications" screen. As far as I can tell, the dash isn't that prominent a feature for GNOME Shell. It's only visible in the activities overview. I don't think GNOME ever call it "GNOME Dash", or even "Dash" with a capital D. It's only because of Ubuntu's customisation, by whatever extension that they selected, that the dash is even visible on the desktop. If GNOME Shell's own dash is the topic, I don't think it needs its own tag - it should be simply tagged gnome-shell. Why should every component of the same software get tags? 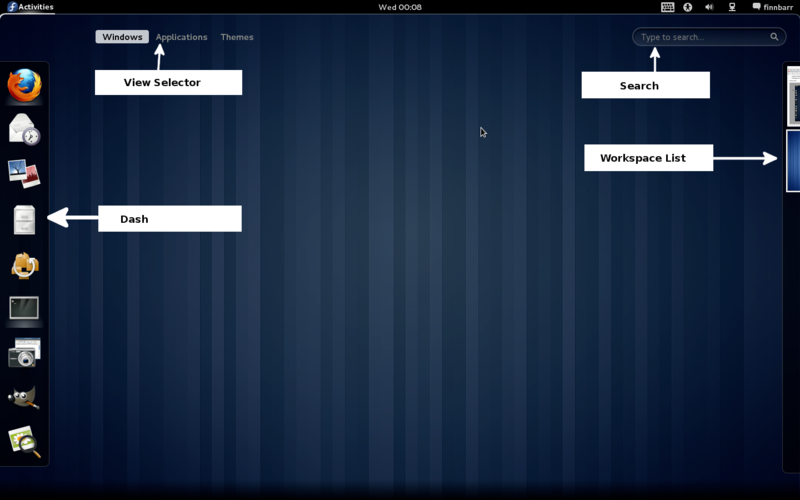 Even if it does need a tag, looking at GNOME Shell's design docs, it's not even at the same level as say, the top-bar. It comes under the Activities Overview, so shouldn't the tag be named after that? If it's about Ubuntu's customised one, then we shouldn't call it "GNOME Dash" - that's misbranding it. Maybe Ubuntu Dash?